Time for another family special. My elder sister started dishing up this combo of Dal & Angakadi after she was married as it was widely eaten in her new household and soon she got us all hooked onto this delicacy as well. In the beginning of my blog, I had posted Gatte ki Sabzi which my younger sis makes exceptionally well. Now it’s time to give some credit to my elder sis. You guys must be wondering, what is Deepali good in? I guess when it comes to cooking (any mode), my mother & sisters win many miles over & I am still learning from them. If you have never tried these, then you must try both versions! 1. In a big bowl mix flour, salt, carom seeds and ghee. Using little water at a time knead a firm dough. The dough should be firmer than required for making regular roti. Cover the kneaded dough and keep aside for 20 minutes to set. 2. After 20 minutes, grease your hands with some oil and knead the dough until smooth. Now make small balls of the dough & roll them into palm sized 1 cm thick rotis. On a hot griddle place 1-2 rotis, depending upon the size of your griddle. 3. When they cook from one side (do not brown them) turn them on other side. When just done, remove from griddle. Quickly using your fingers or tongs, pluck small mounds on one side of the rotis. 4. 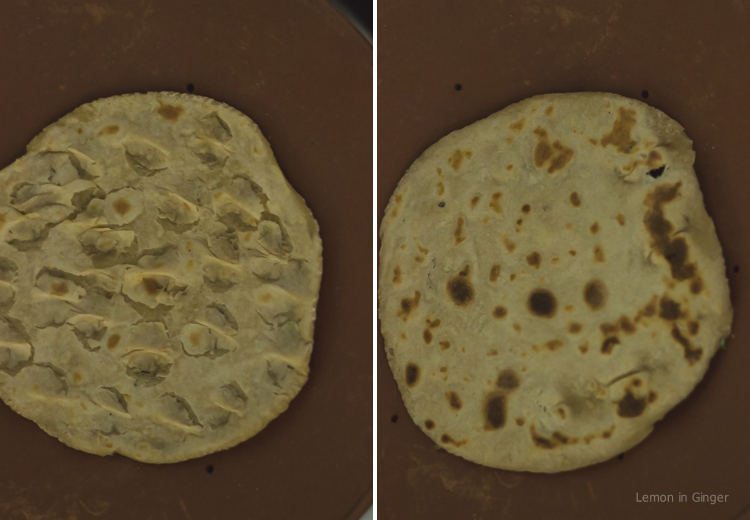 Now the rotis are half prepared & depending upon your choice you can further cook them – fry or cook on direct fire. 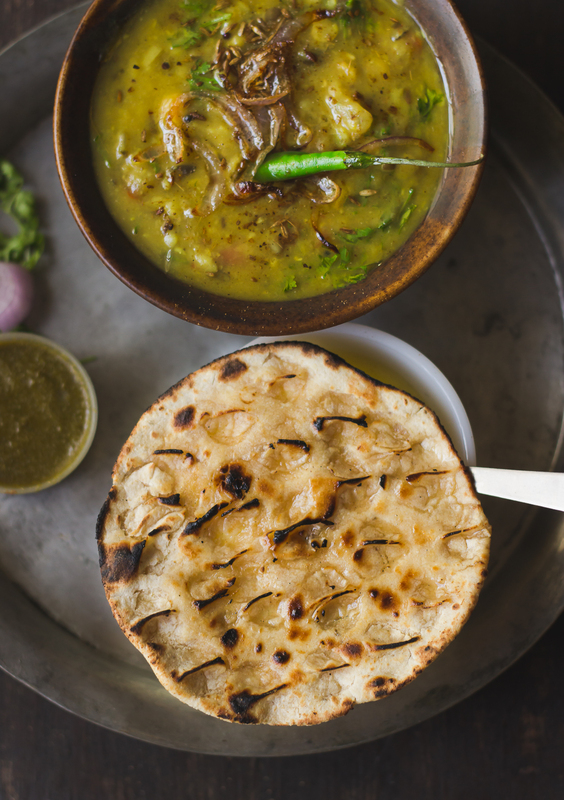 For frying – deep fry the rotis & serve hot with dal. Alternatively, you can cook the angakadis on fire by putting each roti on direct flame and cook on slow fire, till slightly charred and have brown spots on all sides. 5. Place the roti on a plate and spread 1-2 tsp ghee over it. Pour ghee in the holes over roti. It will be absorbed completely. This will enhance the flavor. Delicious Angakadi is ready. Serve with dal or your favorite gravy dish, pickle or chutney and enjoy eating. For a richer version, deep fry the angakadis or cook on slow flame for healthier treat. They taste best with sides of chutney, salad and spicy dal.